It is usually closed to the public and houses Fidelity Bank’s headquarters and the bank’s commercial banking division. “I am really excited to share the building with the public so they can see we are good stewards of this wonderful piece of Wichita’s architectural history,” said Clark Bastian, chairman and CEO of Fidelity Bank. It first opened as a Carnegie Library building in Wichita in 1915 and is listed on the National Register of Historic Places. It served as Wichita’s main library until 1967. The events on Oct. 3 include a “Wizard of Oz” reading and book giveaway; a dedication and garden party; a re-enactor portraying Andrew Carnegie; and a talk from Bastian, about the building’s renovation. Each Wednesday beginning at 11:45 a.m., Fidelity is hosting a series of centennial concerts at Heritage Square, the pocket park next to the Wichita-Sedgwick County Historical Museum. Remaining concerts include Mountain Deer Revival, Sept. 23; and Gooding, Sept. 30. 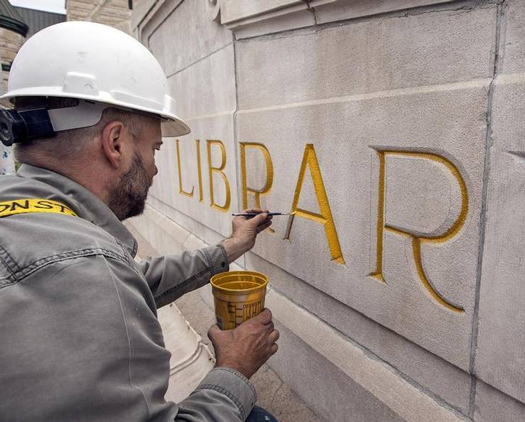 In recognition of its historic importance, the building’s exterior letters of “CITY LIBRARY” above the arched entrance were outlined earlier this summer and painted in gold leaf. The paint is expected to last for up to 30 years. “When it was originally opened in 1915, the Wichita Carnegie Library marked the beginning of Wichita’s cultural renaissance. Far more than a structure to house books, the library gave visitors the feeling that they were entering a cathedral of learning, fine art and cultural ideals,” according to a recent news release.